Cleaning the ventilation hoods of a bake oven, the worker climbed up a ladder onto the bake oven itself to remove metal panels that required cleaning. He also had to stand on the ladder to clean the area around the outside of the hood. After falling and striking the back of his head, the worker called for help and was found by a co-worker. The head wound took five staples to close. The worker also suffered a concussion and soreness to his neck and shoulder. Ontario Shores argued that the fine should be only $30,000 given it was a first offense. A 25 per cent victim surcharge is added to that fine to bring the total to $37,500. Ontario Shores is presently subject to a much larger health and safety investigation by the Ministry of Labour around violence prevention. Glenna Raymond, CEO of Ontario Shores, may feel a little more than embarrassed by the proceedings. Raymond sits on the board of HIROC – the Healthcare Insurance Reciprocal of Canada. HIROC states its vision is to partner to create the safest health care system. While the Ministry of Labour normally posts fines above $50,000 on its website, it leaves interested parties to seek information on most fines below that amount. OPSEU just recently obtained a transcript of these court proceedings. This entry was posted in Uncategorized and tagged Glenna Raymond, Ministry of Labour fines, Ontario Shores Centre for Mental Health Sciences, Violation of the Health and Safety Act. Bookmark the permalink. OS argued first offense and the court let them off lightly? Actually dismissed some of the charges when that worker could very well have been killed? 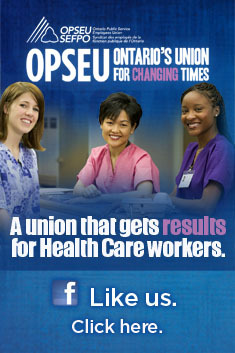 Not very encouraging for Ontario workers to know that they hold so little value to employers and the courts. Maybe they’re hoping thru worker deaths to decrease the unemployment statistics. And OS CEO Glenna Raymond sits on HIROC board that claims to share a vision of creating “the safest” Health Care System? While her own workforce is being exposed to unimaginable perils and subsequent high injury rates. Lives being ruined, changed forever, through employer negligence and failure to adhere to Ontario law. How ironic is that? I love their response: “Ontario Shores argued that the fine should be only $30,000 given it was a first offense”. Wow! That was their MAIN concern!!! The money – not staff safety. Wow! Isn’t this the same facility that had three co-workers watch a pt beat a staff member for over six minutes and did nothing to help?! Red flags should be flying. Good luck to all the staff working to pay their bills and trying to make a safer work environment!!! I wonder if this and the other incidents will effect Ms. Raymond’s bonus this year? I am so sad that this employer had to fined? Now don’t get your knickers in a knot. The reason for my sadness is because a fine usually indicates a staff has been severly injured. It is that injured staff that I feel the sadness for. They will never be the same again. It is really too bad that the MoL does not give out fines for shody and missing training! Next time we are asked to perform a task for the first time or maybe the tenth time we should assess our training to perform this task. It does not matter if we do it thousands of time a year at home we need to listen to our employer’s method of doing the task safely. And if you do not feel their method is safe tell your employer; Tell your Joint Occupational Health and Safety worker members; Fill out an incident report stating that you believe your safety is at risk. Speak up and out as many times as you can in order to make our workplace safe! It is your safety that is at risk! It will be you that will be healing not your manager and definitely not the CEO. As for the 3 OS staff that froze in horror when their coworker was being assaulted, let’s give them a huge break. Those staff froze because they did not have the training or skills to identify the rising risk of violence, intervene before the assault, intervene during the assault and/or call for more assistance. Those 3 staff are traumatized nearly as much as the staff assaulted. Those 3 staff NOW have injuries that are not visible. I commend you for having the sensitivity to recognize it and speak of it but from a humanitarian viewpoint I find their failure to assist deplorable and inexcusable and a sad indictment of our times. I understand that one of three frozen worker’s was a doctor. Are you suggesting that he did not possess the skills or training to recognize the rising risk of violence or was unaware of the aggressor’s level of or potential of violence? The 2nd frozen worker is described as some kind of therapist. How is this person able to ply their trade with patients if they have no conception or ability to identify signs of impending violence? Or worse, not possess the necessary skills to intervene? Or the heart to? As to the 3rd frozen worker… well, how and why are worker’s are being assigned to provide care to a patient population that they are evidently so unprepared for? You are absolutely right about working safely. Mental Health care is a recognized job category that has inherent risks associated with it. All staff must insist on receiving all training, personal protective equipment, with effective policies and procedures in place to mitigate all risks. Fill out incident reports. Exercise RIGHT to REFUSE. Self reflection is also a very necessary component. This work is not for the feint of heart. It takes personal strength and courage to move from a safe place to an unsafe place. If worker’s recognize that they do not possess this kind of special quality as in the instance of those worker’s that froze, please protect yourself and co-worker’s and move onto another career/ area of Health Care that is more personally befitting. The point needs to be made as well, what if it had been a patient that was under attack? I, like many others, would like to know more about the 3 who did not intervene. Something here just doesn’t seem right. I can see one and, stretching my credulity, maybe two but THREE people watching this event at close quarters and not intervening seems a bit much. Were they disciplined? Have any of them made any comment. Are any of them members of 331? Also I find it curious that OS would publicly respond to the article about the video shown the dietary staff but has remained silent on this very serious matter. Lets not forget the focus of the video…the main point is not that people watched no matter how horrendous this may be. The focus of the video is that someone was gravely injured and her life changed forever. An act of violence upon her that could have been avoided if the Administration of the Hospital had clinical experience and knew what they were doing….hence if they were capable and actually gave a darn about safety these terrable assults would stop from happening. The video tells a story of mental illness and how that person arrived there….it is hoped that the video will give others the courage to get help, the courage to stand up and fight for their safety and bring the hospital back to where it once was a safe place for patients, visitors and staff full of dedicated people who put what they love doing first….carring for the ill.
Here’s hoping that the mention of people watching does not take the limelite away from the main focus of the video….Recovery, Hope and something like it never happening again to another dedicated professional. We need to go to work knowing we are safe….it is our right,,,it is the law. Ontario Shores has to realise this and make great changes. Possibly take their yearly bonuses and put them to good use in improving saftey in the hospital….listen to the front line workers what their suggestions are on safety instead of what administration thinks looks good on paper. Yes you need too be able to go to work and know you are safe. It is our right, it is the law. They need to protect the front line workers, and they don’t. They allow us too get hurt and really don’t care. We are hit, punched kicked and abused they have then the nerve of asking us what we could have done different. When the management gets hurt there is always something done about it but when it comes to the front line workers we are always questioned. The abuse we take it outrageous. There is injuries that we go through that can affect you for your lifetime, but it is pushed under the rug and never dealt with.